There is a specific procedure marketing needs to follow in order to be truly successful. We follow this procedure for every one of our custom magazines. 1. Market Research. This includes an understanding of the demographics, the competition and surveys to gain insight into the mind of the target audience. It is a vital component of any successful marketing program. All our custom magazine programs include market research. Successful marketing is based on a good understanding of the product, service or company being marketed. We interview the doctor(s) and find out all about the doctor’s philosophy, approach, strengths and uniquenesses. As a result our magazine is a true reflection of the practice. 3. Strategy. Before embarking on creating any marketing item or campaign, it’s important to have a strategy that will correctly position the dentist. For example, positioning a dentist as an experienced and skilled implant dentist. 4. Copywriting. The art of copywriting is over a century old and has exact principles that when followed creates copy that engages and motivates the reader to procure the service or product offered. 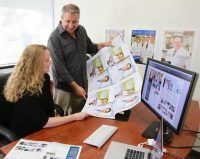 Per the old adage, “A picture is worth a thousand words.” This is certainly true when marketing a dental practice and our magazines are full of photographs of the dentist, the practice, the patients and action photos. Our company photographers are trained in how to get the exact photos that follow the strategy. Before the photo shoot we work with the practice to get specific types of patients in for the photo shoot and we prepare a detailed shot list that will forward your marketing messages. 6. Design. Design puts marketing into an aesthetic format that will attract and interest the viewer. We use the market research to create a design for the magazine that will be attractive and resonate with the target audience. 7. Quality Control. It is vital to conduct thorough quality control. We have a quality control checklist that reviews the magazine against the market research, the strategy and the interviews as well as reviewing it for correct marketing. We also conduct a press check at the printer to ensure the magazine is printed at the highest quality. 8. Distribution. We create detailed distribution plans to put your magazine in front of your correct target demographics. 9. Response Tracking. The only way you know if your marketing is working or if something needs to be changed is by tracking the results, and we use call tracking to track the results of your magazine. We can also listen to the calls to see how well your new patient calls are being handled. We provide scripts and basic scheduling orientation as part of our magazine program. We can additionally deliver phone coaching and in-office receptionist call scheduling training, so that you can make the most out of your marketing. 10. Review. With the information accumulated via your tracking methods, we can do a review and an evaluation of your magazine’s performance. With this information we can enhance your results. As always, we stand ready to help you take your practice to the next level with effective marketing. If you would like more information, please give us a call at 855-486-2410 or click here to email us.